Louisiana Kreutz (Lucy for short) is a director and producer based out of Austin, Texas and her home town of New York City. 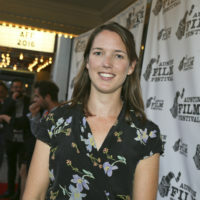 Louisiana’s films include JUNGLE FISH, a documentary about the changing landscape of Guyana’s rain forests, which won the Sundance Institute’s Sustainability Award in 2013, and 61 BULLETS (2014), a feature documentary she co-directed with David Modigliani about the shooting of Senator Huey Long. Her first narrative feature, QUAKER OATHS recently premiered at the Austin Film Festival. In the 8th grade I wrote a spec script for Beverly Hills 90210, which didn’t exactly land me in the writers room with Darren Star, but it did introduce me to the power of screenwriting. All these imaginary scenes in my head could now be on paper! I wrote many scripts after that- making shorts on camcorders in high school and then on 16mm film in college. For the last ten years I’ve focused more on documentaries, so my screenwriting slowed down. But recently I stepped up to make my first feature narrative, Quaker Oaths, and writing that screenplay was a great experience. Now that it’s a finished film I can finally say that I have gotten my start in screenwriting! Writing Quaker Oaths, filming it, and then editing it were all educational steps in becoming a better screenwriter. Jokes that I thought were incredibly funny as I wrote them fell totally flat when the actors said them during a take. Other lines that I didn’t think much about would crack me up in the edit room and still to this day get a big laugh at every screening. It was really unpredictable what would land and what wouldn’t. My producer, Austin Tolin, helped me with the final edit and he pointed out that the biggest laughs come from moments of surprise. I’d never noticed that before. We talked about the difference between witty and funny, which I’m still trying to figure out. So those are things I’m working on for comedy writing. As for the bigger stuff- how to make a film feel real and feel moving- I think that comes from just being vigilant and staying true to your characters and giving thought to what would really happen in these moments you’re creating. The hardest project I’ve had to write has been the follow up to Quaker Oaths, which I’m working on now. I think Quaker Oaths was easy to write because it has a very gimmicky pretense- a couple gets married in the Quaker tradition, where every wedding guest has to sign their marriage certificate, and then years later when they want to get divorced, they have to go to every wedding guest and ask them to cross off their name. That lent itself to a very formulaic screenplay (though I promise we threw some curve balls in there! ), which was pretty easy to execute. My second film is proving to be harder to get down on paper, because it doesn’t have such a specific beginning-middle-end already planned out. I don’t think there’s been one specific point. I finished college at UT and then got an internship at a post production house (the late great Match Frame), and it was there that I met so many great people that I still work with today- Bradley Beesley, Berndt Mader, Ben Steinbauer, Susan Lazarus, Nick Smith, Ron Pippin, Dan Brown…So many good people who have since helped me build a career. So maybe that initial interview for an unpaid gig duplicating vhs tapes and taking lunch orders was the major turning point I’ll look back on. Right now I’m writing a screenplay for a movie I plan to make next year. It’s about the biggest event that ever happened in the United States, which occurred just over 70 million years ago. The film takes place in a small town in the early 1990s and looks at themes like immorality, fame, and mass extinction. Also there are dinosaurs. really out-there premises and somehow bring out some real thruths about our human experience. Charlie Kaufman! That guy has a crazy imagination and also knows how to tug at my heartstrings. My experiences at the Austin Film Festival have always been excellent. The panels are so lively and entertaining and inspiring- the whole time I’m listening to these great minds talk about their craft I’m getting ideas of my own for how to better tell my stories. I love that it’s The Writers Festival, because that is such an important aspect of filmmaking that usually gets ignored at festivals. My favorite experience at the festival is sitting in a hallway at the Driskel hotel, madly writing down notes from a panel I just came from before going onto the next. There’s smoke coming off my pen as I try and summarize the tips I learned from these inspiring pros who shared their experience with us. Plus I love the complimentary notebook AFF gives out.